Peak's Concept, Design and Quote (CDQ) process helps you quickly determine the feasibility and manufacturability of your plastics and packaging projects. Peak can work with you to define and refine your concept to ensure it is efficient, cost-effective and utilizes the correct materials. Once the concept is defined, Peak designs the part, packaging and, optionally, a quick-turn prototype to help you evaluate the design. With high-end CAD / CAM packages including Unigraphics NX2, Master CAM, and AutoDesk Inventor, Peak can meet your design and development challenges. 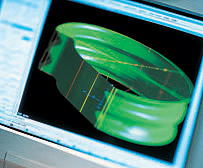 Additionally, Peak maintains in-house design capability using solid / surface modeling and mold flow analysis for analyzing the plastic part behavior at the design stage. Peak's engineers will assist you in meeting your design for manufacturing criteria; designs that will yield lower cost and deliver better performance over the life of your products. The final output of the CDQ process is a quote for various production runs dependent on volumes, materials used, lead time, and delivery requirements.